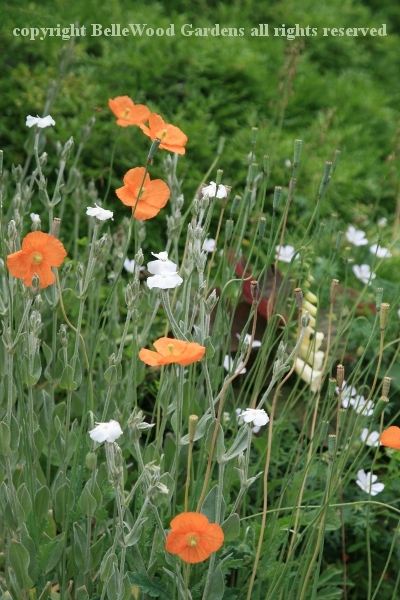 Since today is Poppy Day at Wave Hill, at 2:00 p.m. visitors can join a guided garden walk to look at poppies, poppy relatives, poppy lookalikes. 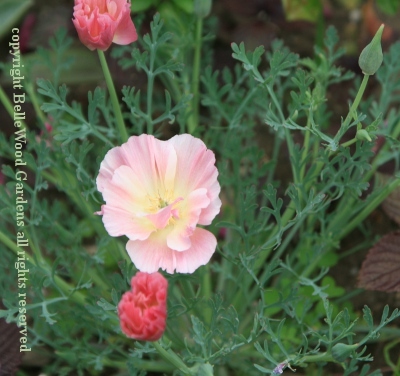 We saw the larger poppy species - Papaver orientale cultivars in the Flower Garden that is in front of the conservatory. Look here if you want to read about them. Then we traipsed over to the Wild Garden to look at poppy lookalikes. 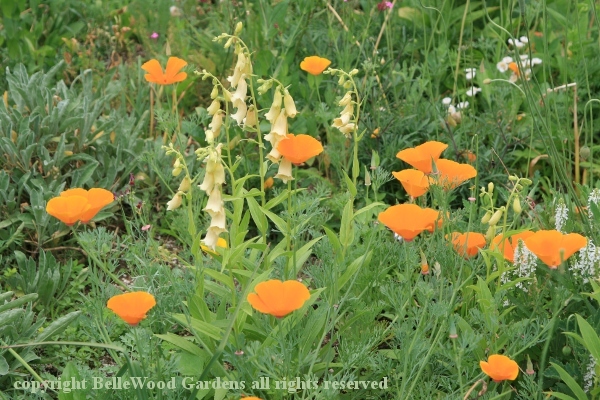 Mostly, this included California poppy, Eschscholtzia californica. But first, a digression. How to spell this plant's genus name. 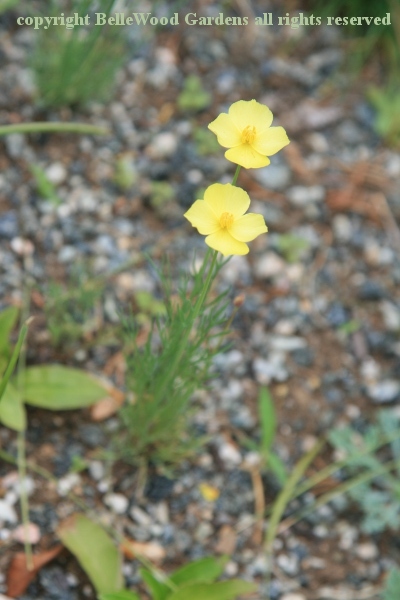 Named for the Baltic German/Imperial Russian botanist Johann Friedrich von Eschscholtz, I have found it variously given as Escholtzia, Eschscholtzia, Eschscholzia. Take your pick. Given how the man spelled his name I guess I'll go for Eschscholtzia. grows, flowers, makes more seed, dies) it flings itself around hither and yon. with the taller spikes of soft yellow perennial foxglove, Digitalis lutea. with white flowered soapwort, Saponaria officinalis 'Alba'. 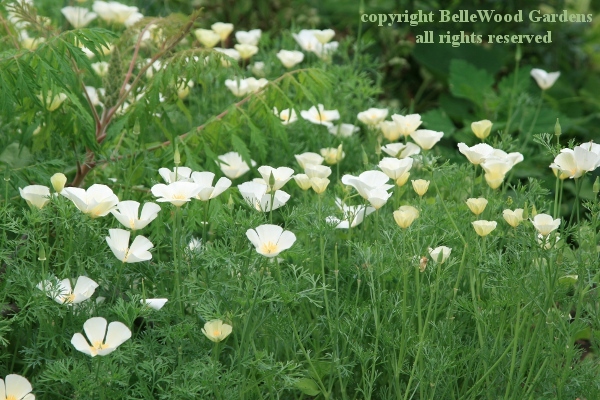 There are some cultivars, cultivated varieties, of California poppy. first a few, then more with golden flowers unless they are rogued out. Same story with this charming 'Rose Chiffon' cultivar. 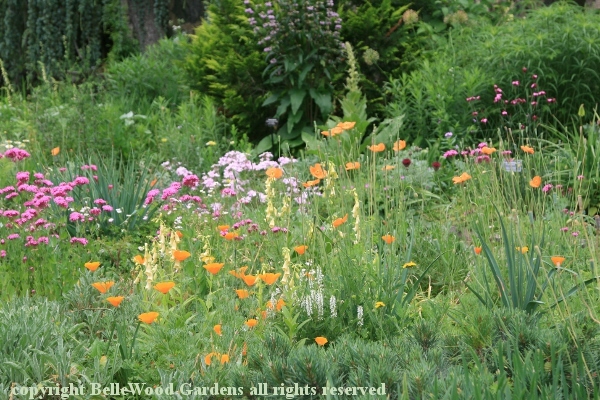 It is not just the smaller, paler yellow flowers with a cute little point to each petal that help to I.D. this species. The thin fine leaves also indicate that this is actually Eschscholtzia caespitosa. There are some poppy relatives that grow in woodland shade, such as our beautiful bloodroot, Sanguinaria canadensis, with its ephemeral white flowers in spring. that is also a wild flower which is native to the eastern United States. 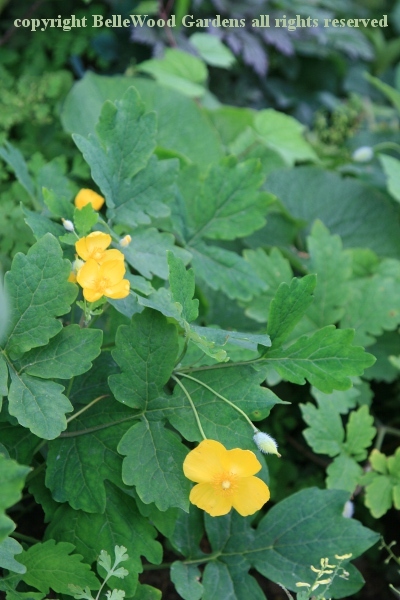 It has a cousin, Stylophorum lasiocarpum, which is native to central and eastern China. Notice the skinnier, upright seed pods, different from the fat drooping ones of the celandine poppy. 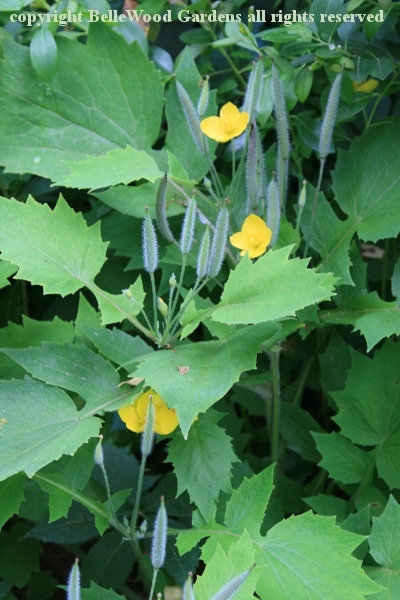 Also, the leaves of celandine poppy have more rounded lobes while the Chinese species has sharper, jagged leave edges. 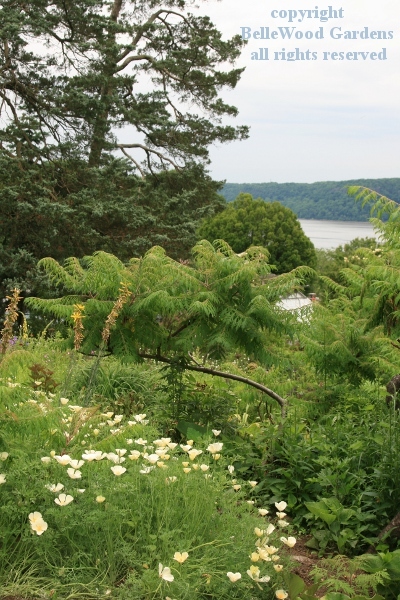 An interesting walk in the beautiful gardens of Wave Hill.